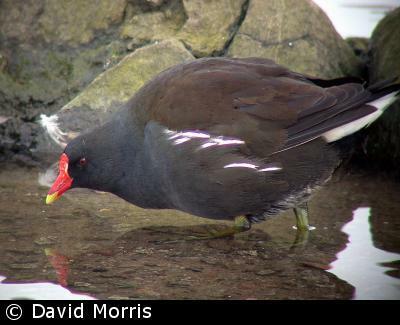 Both sexes: Black with a white tail and red bill and forehead. 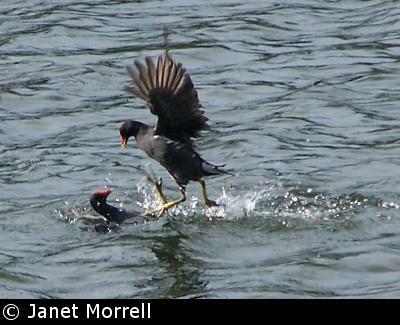 The Moorhen appears mostly black, but a closer look reveals blackish-brown upperparts and grey-black below. Underneath the tail (undertail coverts) are white and there is a white line along the flank. The bill and frontal shield (forehead) is red, the bill having a yellow tip. The legs and feet are a striking yellow-green, and if you are lucky you may catch a glimpse of the red "garter" at the top of the legs. The toes are lobed, not webbed. The eye is red. 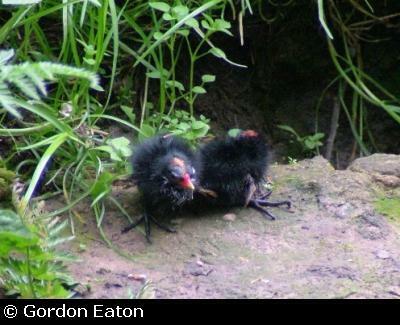 Moorhen chicks have black, downy feathers except round the eye and bill. Juveniles have browner underparts and lack the red frontal shield. Frequently confused with the Coot by beginners, try to remember: "R" is for red, and there are no "R's" in Coot! 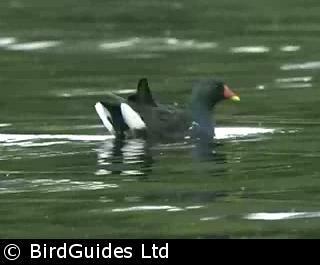 Moorhens tend to be more solitary and feed around the water's edge. Though they appear placid, fighting is common and often prolonged, with each bird striking the other violently with the feet and even attempting to push or drag them underwater. Often, they will surprise you with their loud, explosive "curruk" call. 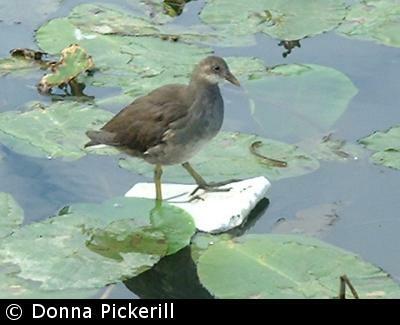 Moorhens feed both on water and land and so have a varied diet of leaves, seeds, berries, worms, snails and fish, and also other birds' eggs. They will take bread in gardens. Generally, the female builds the nest among vegetation in the water while the male gathers the twigs, etc. Their eggs are smooth and glossy, greyish-white to green with reddish-brown or grey markings. They are about 43 mm by 31 mm. Both parents incubate the eggs and look after the precocial nestlings, which when newly hatched are fed in the nest for a couple of days before swimming with their parents. British birds are sedentary but many birds north-west Europe spend the winter in Britain. The population declined in the 1970s and 80s but has since been recovering. The decline seemed to be a result of reduced clutch size and this in turn may be caused by the spread of American mink Mustela vison, which predates birds' nests along waterways.